This topic demonstrates how to use an owner-drawn combo box. The C++ code example uses an owner-drawn drop-down list box to display the four food groups, each represented by a bitmap and a name. Selecting a food group causes the foods in that group to appear in a list. The dialog box also contains a list box (IDLIST) and two buttons: OK (IDOK) and Cancel (IDCANCEL). The IDOK and IDCANCEL constants are defined by the SDK header files. The constant IDLIST is defined in the application's header file, as is the control identifier, IDCOMBO. For more information about dialog boxes, see Dialog Boxes. The code example uses the DialogBox function to create a modal dialog box. The dialog box template, IDD_SQMEAL, defines the window styles, buttons, and control identifiers for the combo box. The combo box in this example uses the CBS_DROPDOWNLIST, CBS_OWNERDRAWFIXED, CBS_SORT, CBS_HASSTRINGS, WS_VSCROLL, and WS_TABSTOP styles. Step 2: Process the WM_INITDIALOG and WM_DESTROY messages in a dialog box. When you use a combo box in a dialog box, you usually respond to a WM_INITDIALOG message by initializing the combo box. The application loads the bitmaps used for the owner-drawn combo box and then calls the application-defined InitGroupList function to initialize the combo box. It also selects the first list item in the combo box and then calls the application-defined InitFoodList function to initialize the list box. In the example, the owner-drawn combo box is a drop-down list box that contains the names of each of the four food groups. InitGroupList adds the name of each food group , and uses the CB_SETITEMDATA message to associate a bitmap handle with each list item that identifies a food group. The list box in the example contains the names of foods in the selected food group. InitFoodList resets the contents of the list box, then adds the names of the current food selection in the current food group drop-down list box. // Call an application-defined function to load bitmap resources. // Initialize the food groups combo box and select the first item. // Initialize the food list box and select the first item. When it receives the WM_DESTROY message, the application deletes the bitmaps in the owner-drawn combo box. // Call the application-defined function to free the bitmap resources. Step 3: Process the WM_MEASUREITEM message. An owner-drawn combo box sends the WM_MEASUREITEM message to its parent window or dialog box procedure so that the application can set the dimensions of each list item. Because the example combo box has the CBS_OWNERDRAWFIXED style, the system sends the WM_MEASUREITEM message only once. Combo boxes with the CBS_OWNERDRAWVARIABLE style send a WM_MEASUREITEM message for each list item. The lParam parameter is a pointer to a MEASUREITEMSTRUCT structure that identifies the control and list item. It also contains the default dimensions of the list item. The example modifies the itemHeight structure member to ensure that the list items are high enough to accommodate the food-group bitmaps. // Set the height of the items in the food groups combo box. Step 4: Process the WM_DRAWITEM message. An owner-drawn combo box sends the WM_DRAWITEM message to its parent window or dialog box procedure each time the application must repaint a list item. The lParam parameter is a pointer to a DRAWITEMSTRUCT structure that identifies the control and list item. It also contains information needed to paint the item. The example application displays the list-item text and the bitmap associated with the food group. If the item has the focus, it also draws a focus rectangle. Before displaying the text, the example sets the foreground and background colors, based on the item selected. Because the combo box has the CBS_HASSTRINGS style, the combo box maintains the text for each list item that can be retrieved using the CB_GETLBTEXT message. The bitmaps used for the list item depend on the food group. InitGroupList uses the CB_SETITEMDATA message to associate a bitmap handle with each list item. The window procedure retrieves the bitmap handle from the itemData member of the DRAWITEMSTRUCT structure. The system uses two bitmaps for each food group symbol: a monochrome bitmap with the SRCAND raster operation to erase the irregular region behind the image, and a color bitmap with the SRCPAINT raster operation to paint the image. // Get the food icon from the item data. // The colors depend on whether the item is selected. // Calculate the vertical and horizontal position. // Get and display the text for the list item. // TODO: Write error handler. // Restore the previous colors. //  Draw the food icon for the item. // If the item has the focus, draw the focus rectangle. Step 5: Process the WM_COMMAND message. When an event occurs in a dialog box control, the control notifies the dialog box procedure by means of a WM_COMMAND message. The example processes notification messages from the combo box, the list box, and the OK button. The control identifier is in the low-order word of wParam, and the notification code is in the high-order word of wParam. If the control identifier is IDCOMBO, an event has occurred in the combo box. In response, the dialog box procedure ignores all other combo box events except CBN_SELENDOK, which indicates that a selection was made, the drop down list box was closed, and the changes made should be accepted. The dialog box procedure calls InitFoodList to reset the contents of the list box and to add the names of the current selections in the drop-down list box. If the control identifier is IDLIST, an event has occurred in the list box. This causes the dialog box procedure to ignore all list box events except LBN_DBLCLK, which indicates that the user has double-clicked a list item. This event is processed in the same way as if an OK button had been chosen. If the control identifier is IDOK, the user has chosen the OK button. In response, the dialog box procedure inserts the name of the selected food into the application's multi-line edit control, then calls the EndDialog function to close the dialog box. If the control identifier is IDCANCEL, the user has clicked the Cancel button. In response, the dialog box procedure calls EndDialog to close the dialog box. // For a double-click, process the OK case. // Get the text for the selected list item. // Here it is assumed the text can fit into achTemp. // If there is doubt, call LB_GETTEXTLENGTH first. // TODO: Do something with the selected text. 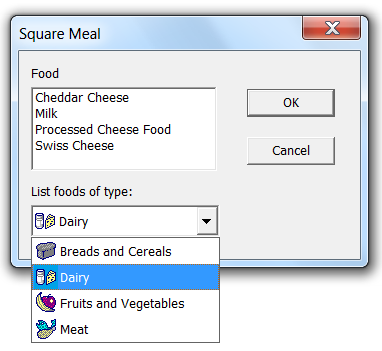 Following is the dialog box procedure and the supporting functions for the Square Meal dialog box. // Message handler for Square Meal dialog box. //   stored as item data for easy access when the item needs to be drawn. // Get the handle of the food groups combo box. // Clear the list contents. // Find out which food group is selected. // Loads the food icon bitmaps from the application resources. // Frees the icon bitmps.